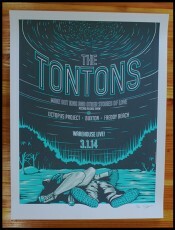 We just launched a limited edition silkscreen print designed by Chris Nolen for The Tontons record release show in celebration of the upcoming: ‘Make Out King and Other Stories of Love’ at Warehouse Live in Houston, Texas March 1st 2014. This is the first of multiple collaborations we have upcoming with The Tontons, more to be announced soon. This print is an 18×24″ 3-color silkscreen printed on heavy 100# cougar smooth coverstock. The dark grey layer includes a brilliant metallic silver hue.